The latest work by American artist Michael D’Antuono has once again drawn ire from US conservatives for pointing out the hypocrisy amongst their ranks. 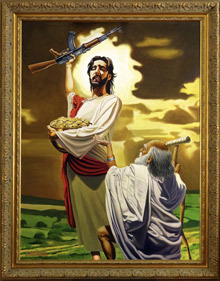 His latest work, The Conservative Christ, depicts Jesus with an AK-47 hoisted into their air, clutching tightly to a pot of gold, and sneering derisively at a poor, old man. By illustrating precisely what Jesus would not do, D’Antuono draws attention to the awkward dissonance between Conservative’s sociopolitical beliefs and their supposed adherence to Christian values. It was in an attempt to understand this conflict that inspired him to create the work. It seems like the ultimate in sanctimonious hypocrisy to identify yourself with Christ and also with conservative policies. Christ’s teachings of compassion, forgiveness and acceptance just don’t align up with Republican positions on entitlements, healthcare, immigration and marriage equality. Abortion is the one issue I can see where Jesus might agree with the right and maybe that trumps everything else for them. Even with that, it’s hard to understand dichotomy of how they can be protective of the unborn, but generally hawkish when it comes to creating wars that kill fully realized individuals. A strong constitutionalist, I think Glenn truly [believes] in defending my first amendment right to exhibit my painting even though he and I differ greatly politically. He’s also a smart businessman. Talking about my painting and trying to sell his piece inspired by it gained him a lot of attention. Also, covering my art gets a large amount of comments from his audience. I have to give him and his organization credit as despite our philosophical differences, they have always represented me fairly.